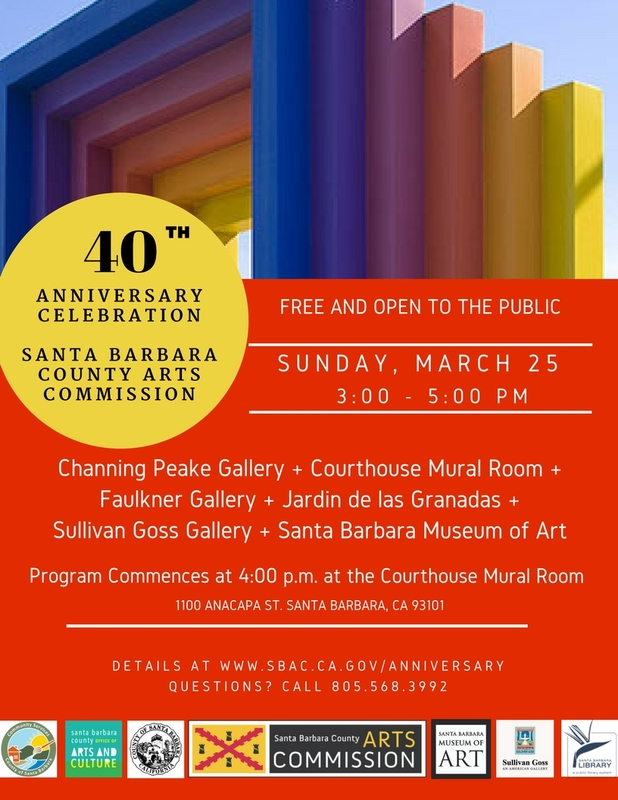 Please join us to celebrate the 40th Anniversary of the Santa Barbara County Arts Commission on Sunday, March 25 from 3-5 p.m.
A formal program will take place at 4 p.m. in the Historic Mural Room of the County Courthouse. During the event, Channing Peake Gallery, Courthouse Mural Room, Faulkner Gallery, Jardin de las Granadas and Sullivan Goss Gallery and the Santa Barbara Museum of Art will be open with corresponding exhibitions and programming. The program will provide a special opportunity to applaud local artists and arts advocates, and to really reflect on the magnificent evolution of Santa Barbara's arts culture over the last four decades. Questions? RSVPs? Send us a note!